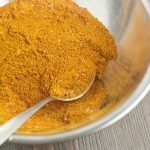 I've been dying to make a dish with these fragrant spices and this meal did not disappoint! 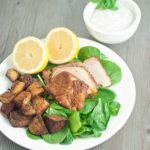 Moroccan Pork Roast is well balanced with this Tangy Coconut Yogurt Sauce (and terrific with the Moroccan Spiced Potatoes – recipe to be posted next week). One of my best friends went to Morocco and brought me back bags of fresh spices that he got straight from a market. Since he gave me these spices my kitchen has been soooo fragrant. Every time I walk in the apartment I start imagining dishes that I could make with them. 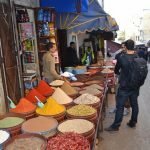 Sounded like a great trip and I might need to add Morocco to my to-visit list! Anywhere with great food, right? 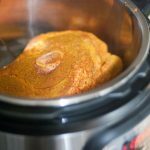 Holley and I have been raving about our Instant Pots since we got them. But we've only put a handful of recipes together so far (even though we both use them on the regular). 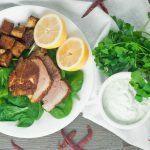 This complete meal (Moroccan Spiced Crispy Potatoes – coming soon, Moroccan Pork Roast, and the Paleo Coconut Yogurt Sauce) was all cooked in the Instant Pot. BUT, don't worry if you don't have one (yet): I supplied some options as to how to make this meal without them. We always want to make our recipes as accessible as possible! 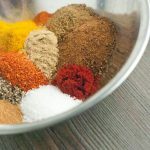 Mix all ingredients together and use as needed for seasoning desired dishes. 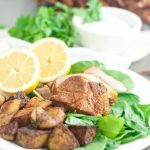 Instant Pot Moroccan Pork Roast with Tangy Coconut Yogurt is an easy and flavorful meal! st step is to look at that beautiful piece of meat and picture what it's gonna look like when we're done (you can cheat by looking at the photos above). 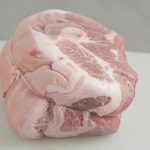 Now let's cut off the skin and about half of the layer of fat (I'm assuming that you chose a pork picnic roast too). You want some of that fat for cooking. Flavor, moisture, and whatnot. Using a small knife, poke some holes in the roast – 8 holes to be precise – and stuff the garlic slivers into them. You can do more if you love garlic like I do. 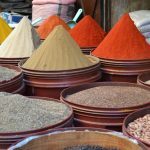 Remember the Moroccan Spice Mix from above? You're going to rub about 1/4 cup of it all over the roast with your hands. 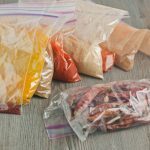 These spices can stain your hands, so if that's an issue use a plastic glove. The other thing to keep in mind is that some of the spices are going to fall off while applying them and get everywhere, so do this over a large bowl or cutting board or something (I don't like cleaning up, so I like to reduce the chaos as I go). Using the trivet (the metal grate thing) in the bottom of the Instant Pot, add water (which shouldn't reach the top of the trivet) and then place the roast inside the pressure cooker. Secure lid, press “Manual” and then using the “+” button set the timer to 90 minutes. After you double-check that the steam release valve is in the “Sealing” position, take a load-off. Maybe pour yourself a drink. You've earned it. 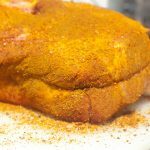 If you want to crisp up the outside of the roast a bit when it's done in the IP (do an instant pressure release if you're in a hurry), preheat the oven to 450F, transfer the pork to a roasting pan, and cook for about 15-20 minutes (this is what I did). 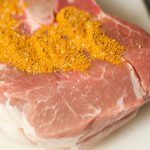 Allow meat to rest at least 10 minutes before slicing it up. 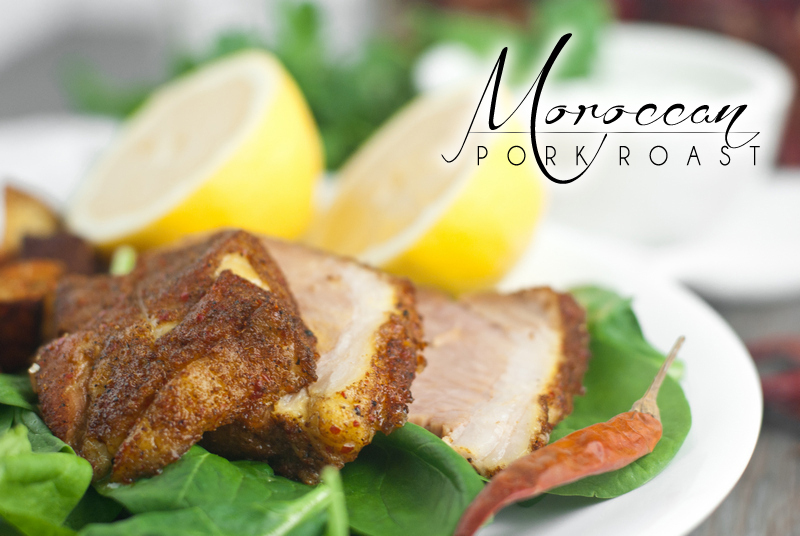 Sprinkle with lemon juice and serve with Tangy Coconut Yogurt Sauce. Not IP instructions in notes. 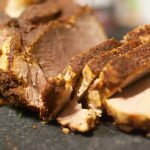 Don't have an Instant Pot? WHAT? Learn about them here and buy one (with coupon code) here! 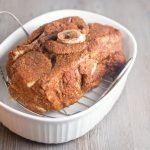 -Once spices have been massaged onto the roast put into a roasting pan, pierce with a meat thermometer, and cook in 275 F preheated oven for about 3 hours. -Meat thermometer should read between 145 – 160 F (145 F is the American recommendation, whereas 160 F is the Health Canada's suggested temperature). 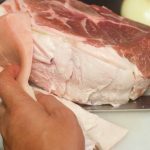 Allow meat to rest at least 10 minutes before slicing. Stir all ingredients together thoroughly in advance. 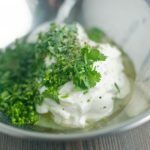 Allow to sit in fridge until needed (you can serve immediately, but the flavors blend better with a little time). That is high praise! I’d like to start off by saying your beard is money! But the thought of putting glitter in my beard terrifies me. I’ve actually looked for a word for glitter-phobia but failed. Tell me more about this Romertopf. I glanced at their site briefly but thought it better to hear from you about your experiences. Thanks for letting us know about your experience! !